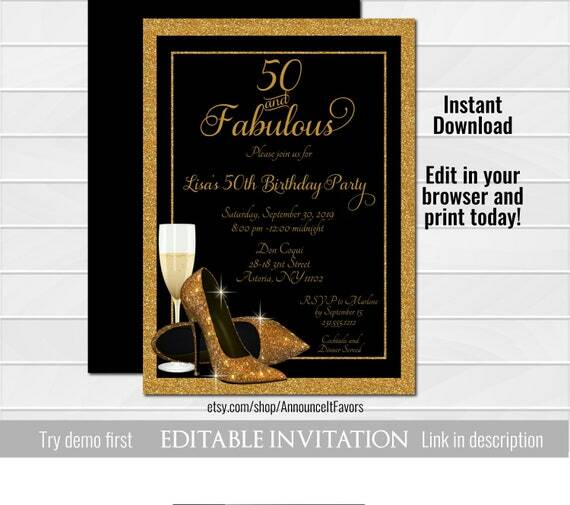 Gold Glitter Shoes Adult Birthday Party InvitationInstant download. This is a 5" X 7" editable printable invitation (DIGITAL FILE) that you edit and print. ♥DEMO♥ this invitation now, Try before you buy, simply copy and paste the link below into your browser window. Personalize online from any device, including cell phones. So fast and easy! EDIT AND PRINT YOUR INVITATION TODAY! If you would like this invite printed with envelopes, please purchase our printing services here. ♥ CHOOSE and PURCHASE your favorite design. You will receive an email shortly (usually immediately) from 'Corjl' with a link to access and edit your file. You can also go directly to Corjl.com and enter your Etsy email address and Order number (not transaction number). You may also use a JPG file for social media. PDF files are typically printed at home, your local office supplies store or any professional printer. ** Please Note** This design is for personal use only (non-commercial use). Announce It! retains all image design rights. You may not share,sell or redistribute this design.